Prepare the polenta according to the packet instructions. Heat the olive oil in a pan, briefly sauté the onion and garlic, add the spinach, cover and allow to wilt, season with salt, cover and set aside. Bring the water and vinegar to the boil in a pan, reduce the heat. Crack the eggs into a cup, one at a time. and carefully slide into the gently boiling water. Poach the eggs for about 4 mins. at just below boiling point, remove with a slotted spoon, drain. Put the butter in a pan, melt and simmer over a medium heat for approx. 7 mins. until the butter smells nutty and is turning brown, allow to cool a little. Season the butter with lemon zest, salt and pepper. 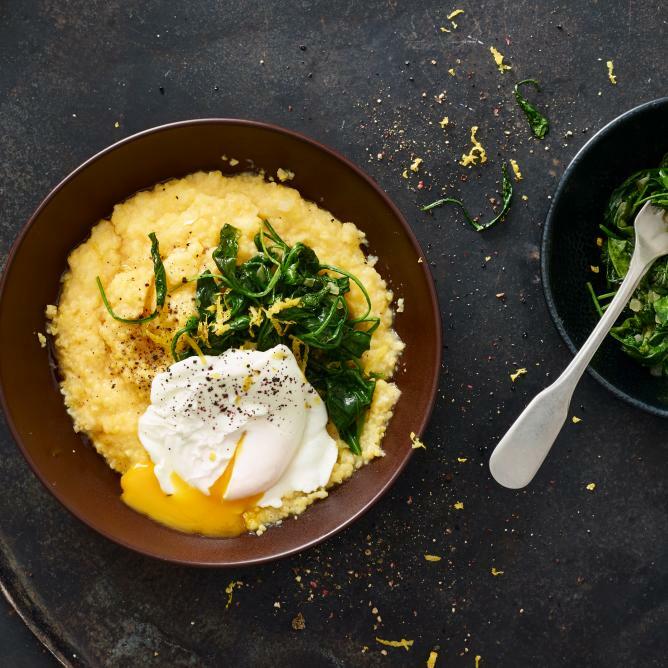 Serve the polenta in deep dishes, topped with the spinach and poached egg and drizzled with the warm butter.